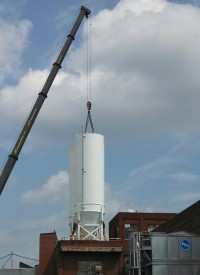 Last Week, GSM Industrial’s field team installed two silos that were fabricated and shipped from its facility in Lancaster, PA. The fabrication and installation of these silos, each with an overall height of 50’ and a diameter of 14’, showcased GSM Industrial’s exceptional capabilities on projects of this scope and nature. A job well done! A Job Safely Done!